Most of Ketchikan's snowfall this winter has been at higher altitudes. 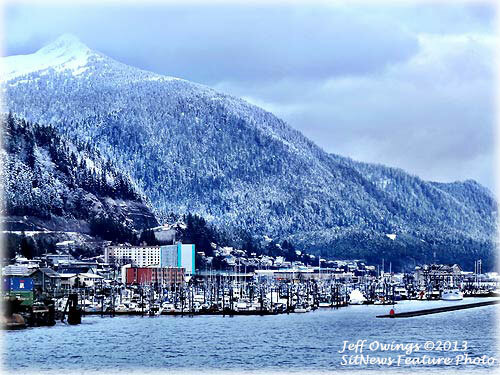 The photographer captured this image of Ketchikan and snowy Deer Mountain while aboard the IFA ferry as it pulled away. Southeast Alaska: Trout Unlimited Distances Itself From New Sealaska Lands Bill; Trout Unlimited Sets the Record Straight - A conservation group this weekend said it does not support a plan by Alaska's delegation to allow an Alaska Native-owned corporation to acquire roughly 70,000 acres of the Tongass National Forest for logging, energy and tourism development. Saturday, Trout Unlimited, the nation’s oldest and largest coldwater fisheries conservation organization, announced that contrary to a misleading media release issued by Sealaska Corporation, it does not support newly introduced legislation that would carve some 70,000 acres from the Tongass National Forest and transfer it to the Juneau-based corporation. Trout Unlimited also never requested inclusion of 94,000 acres of conservation lands in the bill, as stated by Sealaska. The legislation, known as the Sealaska bill, is sponsored by Sen. Lisa Murkowski (R-Alaska) and aims to settle land claims by Sealaska , a regional Native corporation representing shareholders with ties to Southeast Alaska. Trout Unlimited does not dispute that Sealaska is owed land under the Alaska Native Claims Settlement Act (ANCSA) of 1971, “But the inference by Sealaska that they have bought our support of this legislation with a tiny amount of conservation lands is false,” said Tim Bristol, Manager of Trout Unlimited’s Alaska Program. “It appears as though their executives are trying to pull the wool over the public’s eyes by implying they have buy-in from Trout Unlimited” said Bristol. Southeast Alaska: 14-Year Old in Custody in Kake Homicide Case - After an intensive 10 day investigation into the death of 13 year-old Mackenzie Howard of Kake, Alaska on February 5th, a suspect in this investigation has been identified. A 14 year-old male from the community of Kake has been placed in custody by the Alaska State Troopers and has been transported to a Department of Juvenile Justice holding facility in Ketchikan. Because the suspect is a juvenile his name and charges that are pending against him cannot be released. Southeast Alaska: Southeast Conference Hosts Mid-Session Summit; Summit to celebrate AMHS’s 50th anniversary and Build Stronger Regional Leadership - From February 25th through 28th, Southeast Conference will host its annual Mid-Session event at Centennial Hall in Juneau. According to Shelly Wright, Executive Director of Southeast Conference, this year is particularly exciting because it marks the 50th anniversary of the Alaska Marine Highway System (AMHS). Alaska: Unauthorized eavesdropping allegation made by UAF - Alaska’s largest statewide commercial fishing trade association announced it is beginning the process to request Alaska authorities to investigate what they say was unauthorized eavesdropping of their United Fishermen of Alaska private teleconference by the Kenai River Sportfishing Association's office. According to UFA Interim President Bruce Wallace, on January 17, 2013 the United Fishermen of Alaska, representing 34 member organizations, held a private teleconference. In addition to 25 UFA Board members, UFA alleges an individual or individuals at the offices of the Kenai River Sportfishing Association (KRSA) was also on the line during the private teleconference. Alaska Science: Alaska bucks the global temperature trend By NED ROZELL - This just in: 2012 was the coldest year of the new century in Fairbanks, and the second coldest here in the last 40 years. The rest of the world has not been going Alaska’s way. For the 36th consecutive year, the yearly global temperature in 2012 was warmer than average. That temperature, calculated from satellite data by researchers with NASA’s Goddard Institute for Space Studies, was about 58.3 degrees Fahrenheit (Fairbanks’s was 24.1 degrees F). Science: Climate Change Impacts to U.S. Coasts - According to a new technical report, the effects of climate change will continue to threaten the health and vitality of U.S. coastal communities' social, economic and natural systems. DOUG PATTON: Gun Violence Victims Not the Only Ones Who "Deserve a Vote" - Barack Obama can spin a lie into what sounds like something akin to the truth better than anyone in politics has done in my lifetime - and that's saying something because it's starting to be quite a long time. His State of the Union speech was Exhibit A. "They deserve a vote," he intoned during the obligatory gun control portion of his speech. "They deserve a vote," he repeated, just in case you missed it the first time. "Gabby Giffords deserves a vote. The families of Newtown deserve a vote. The families of Aurora deserve a vote. The families of Oak Creek and Tucson and Blacksburg and the countless other communities ripped open by gun violence — they deserve a simple vote." DANNY TRYEE: Voluntary Retirement: Can You Take A Hint? - With an editorial titled "Pope Sets Example For Other Aging Leaders," USA Today tried laying a major guilt trip on the nation's authority figures. Despite using disclaimers such as "There is no magic age for retirement," the newspaper clearly wants to shame prominent people into voluntarily giving up the reins of power.